Happy new year! May 2019 deliver you a bucket load of happiness and everything else you’re wishing for. This year, I’m going to make an effort to live more sustainably, starting with Veganuary (I promise I won’t bore on about it) and making ethical shopping choices as much as possible. I’ll share my favourite findings with you – from eco retreats and shopping to easy and green life hacks. So, the first business I’d love to tell you about is Wyatt & Jack, based on the Isle of Wight. 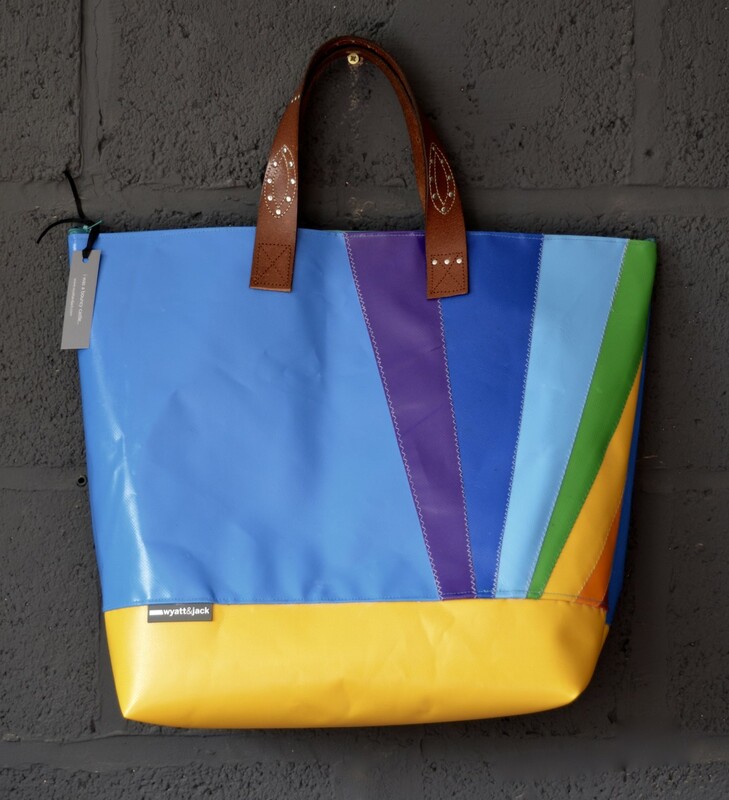 The lovely founder and designer, George Wyatt-Lovell, transforms discarded bouncy castles, deckchair canvas and inflatables into colourful ethical bags and accessories. George moved back to the island eight years ago to be nearer her family. She shared a workshop with a friend’s father, who was one of the first beach concessionaires on the Isle Of Wight. One morning, after he’d unfortunately developed early onset Parkinsons, he asked George to remove the yellow PVC from some old sun loungers, so he could scrap the metal. She did so and fell in love with the old yellow plastic. She couldn’t part with it – so made herself a bag. Wyatt & Jack also have an Inflatable Amnesty Initiative – where you can post them your old/broken inflatables to be turned into a new ethical bag, or other accessory. So no excuses for keeping that punctured old paddling pool in your shed. Brilliantly, they’ve saved 7/8 tonnes of fabric, including inflatables, in the last six months. And incredibly, around 20-30 tonnes since the business began 8 years ago. I bought one of the large tote bags last year (see above) and I absolutely love it. 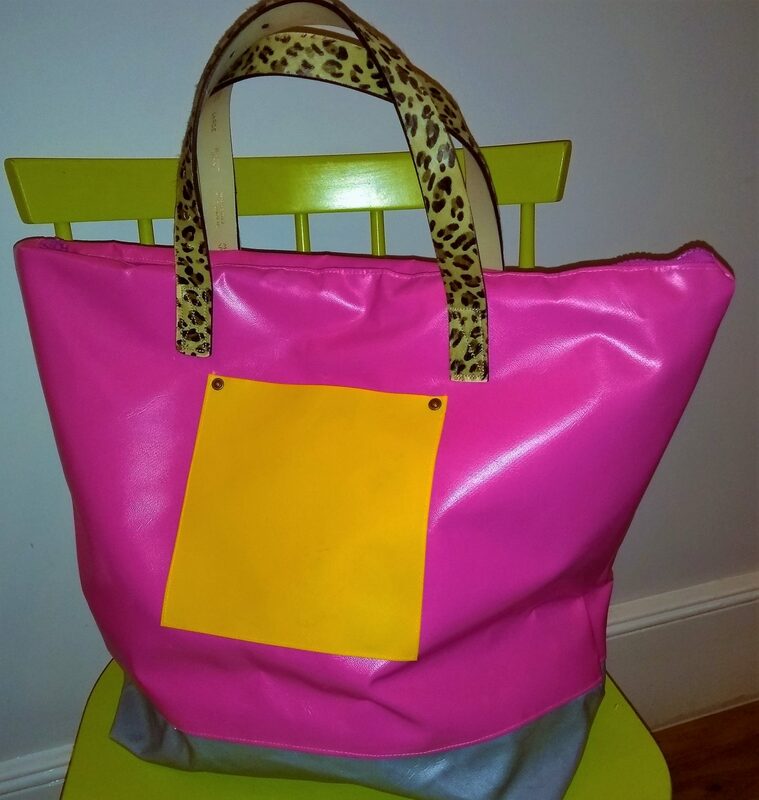 It’s neon pink, with a leopard print strap and stripy deckchair canvas inside. Just looking at it makes me feel happy! It’s a perfect size for days out or going swimming, when you need to haul around towels and a lot of stuff for kids. If you’re super organised are thinking ahead to Valentine’s Day, they also make really cool cycling bags, if your other half is into that. 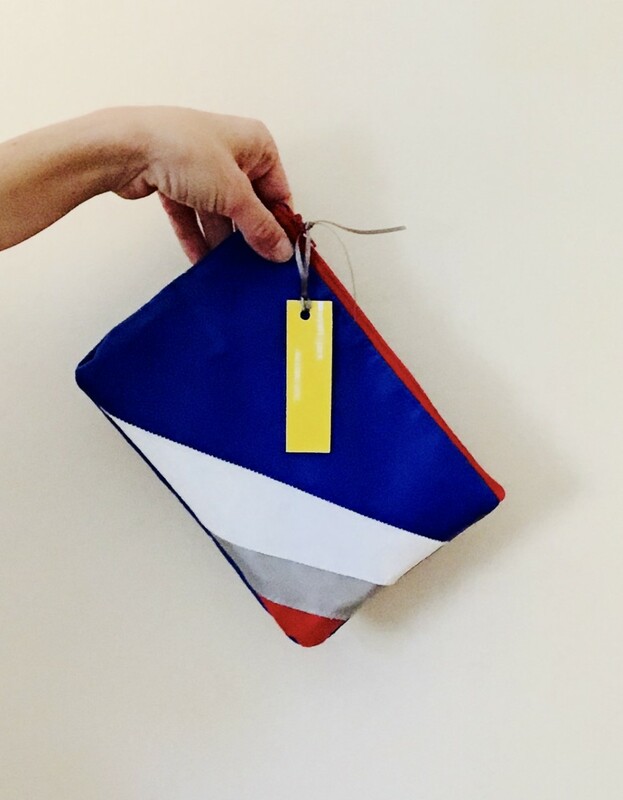 If you’d like to own one of these beautiful ethical bags, or know someone who’d appreciate one, you can use the code JABBERWOCK1 for a 5% discount. Head over to Wyatt & Jack’s site here. Like this post? You might also enjoy this review of Triclimb’s pikler triangle. If you buy a bag from Wyatt & Jack with the Jabberwock voucher code, I will receive a small commission. I only promote products that I've used myself and am passionate about. What a great idea to recycle old bouncy castles. 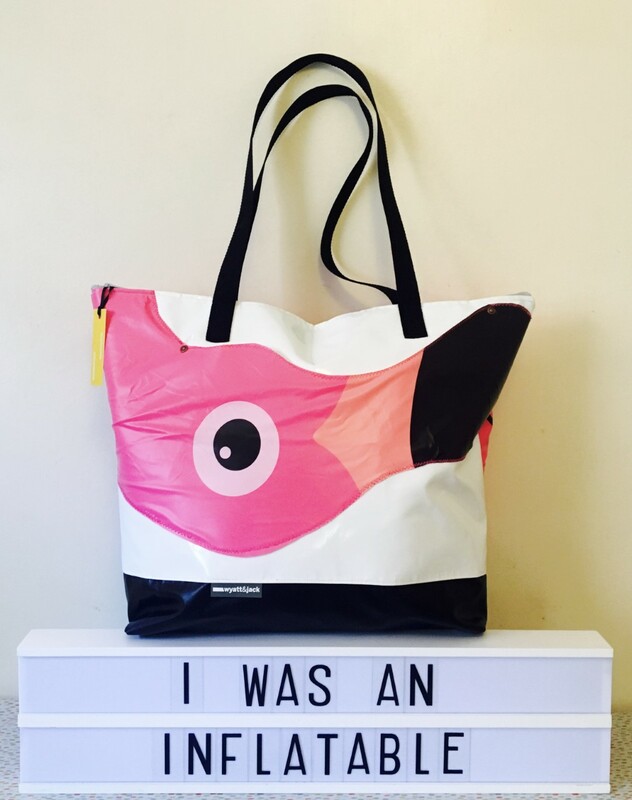 I love the fun flamingo design bag too. I know, I love that one too! Oh now that’s such a good idea and how beautiful are these designs. I would love one. They’re lovely aren’t they! Perhaps treat yourself! Me too, you can’t miss me with my pink one! Wow, what a fab idea and they look great too! These bags are so unique: love them! I love a bit of upcycling and ethical fashion. Thanks for sharing. Love this idea! I’ve a crab paddling pool that would make an amazing bag! Ooh, you should send it in! It’s lovely to see products that are ethical and really cool, too! Awww wow what a fab idea and such beautiful designs. Good luck with this venture.